A few years back, when I had only recently volunteered to register cetecean strandings in my area, I got a text to say there was a porpoise washed up on the far end of Tramore beach. It turned out to be a female Harbour Porpoise. She had numerous gashes and wounds and looked like she had only recently died. I thought it may have been the result of a clash with a propeller. I took photographs, measurements and skin samples. The next day the Irish Whale and Dolphin Group(IWDG) emailed to say that they thought the injuries were the result of an attack by Bottlenose Dolphins. They told me that someone would come and take it away for post mortem but they wouldn't arrive until the following day. "Who do you think I am?Speedy Gonzales?" The 'post-mortem-ers' text to say they had reached the tree branch but all they could find was a rotting seal. It looked like the tide may have taken our porpoise. I got to my car and drove to the beach. I still had another twenty minutes to walk. I left my jacket behind in the car as I was sweating but it was a huge mistake as there was a furious wind on the beach and I went from boiling to freezing in minutes. Shivering and with alcohol still bucketing out of my pores I got to where I had left the porpoise and found it was still there but the windswept strand was empty of people. I stood up a ridge of stones and, scanning about with my binoculars, I saw two figures bbeyond the dunes. I realised the 'post-mortemers' had found an entirely different branch complete with its own entirely different carcass. It started to rain. Once we met up we realised that though they had a tarpaulin it would be extremely difficult to get the 150 lb animal to their car, there being only two of them, both tiny girls. I am bigger but I was one-handed. We would need more bodies. I was exhausted. But I needed to to find some victims...I mean volunteers. As I walked back to the car. I started texting. The friend who had first reported the porpoise wasn't available. Another was out of town. My brother was up for it but I knew his back was bad. Then I tried Oceanics Surf & Marine Education Centre and as luck would have it they were interested. I slapped myself on the head with my good hand wondering why I hadn't thought of them in the first place. The students went back up the beach to start hauling and I went to Oceanics. Some people who had just come in from surfing were standing around outside. One of them, Liam, was, as luck would have it, a UCC zoology student. They were eager to help and in no time I had a car load of laughing young men. We found the students near where I had left the porpoise, already tired and relieved to see us. The boys donned latex gloves and set to with gusto dragging the tarp, swapping places, asking questions, joking. It was still windy but the sun had come out. We eventually made it back to the car, loaded up the porpoise and waved goodbye to the girls. It was 3pm by the time I text my friend to say I was on the way back with breakfast. Bottlenose Dolphins are bigger(6-13ft) than the smaller Common Dolphin. Bottlenose Dolphins are the ones who leap about doing acrobatics. Their necks are more flexible than other dolphins' due to five of their seven vertebrae not being fused together as is seen in other dolphin species. Fungi, the friendly Dingle Dolphin is a Bottlenose Dolphin. Bottlenose Dolphins attack porpoises and people too. It is believed the attacks may be territorial though not too much is known hence the desire for a post mortem. The post-mortem confirmed that it had been a Bottlenose attack. 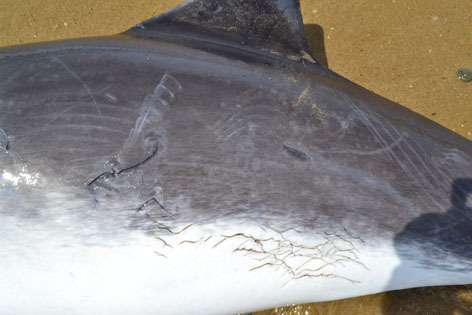 Along with the gashes the porpoise had broken ribs and one punctured lung. She had taken a beating and probably died after swimming onto the beach to escape. 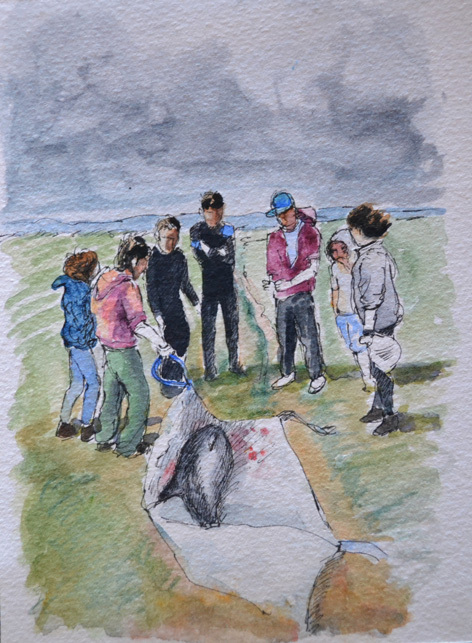 Later, when I was looking at the sightings reports on the IWDG website I saw that a school of eight Bottlenose Dolphins had been spotted twelve miles south east of Mine Head in West Waterford on the day after the porpoise had stranded. I suppose its wrong to assume that these were the dolphins who attacked the unfortunate porpoise or to anthropomorphize any animal but for a moment I couldn't help imagining them as marauding hooligans of the sea, shouting and fighting their way up and down the coast causing watery mayhem:scaring old cod fish, tying octopi tentacles up in knots, hi-jacking sharks, setting fire to lobster pots and beating up on those more unfortunate enough to get in their way. Thanks to Paul at Oceanics Surf Centre and Jai, Dylan, Paul, Martin and Liam for the immediate and enthusiastic response. Hugely appreciated. *A note to say if you ever find a live animal and want to pull it back into the sea, never ever ever pull it by its tail as that damages its back and renders it unable to swim. Corpses are regularly washed up that have ropes tied to their tails telling of previous well-meaning but disastrous attempts to refloat an ailing animal.